Six winters have passed since the last spell of prolonged cold weather in this part of the south. We have had odd sprinkles of snow during that time, and one decent covering, but Dorset has remained fairly balmy for the most part. As a result, the recent blast of Siberian winter came as quite a shock, and certainly altered the pattern of my February fishing. The month itself was focussed around the visit of my friend Martin towards the end of the month. We had earmarked Sunday to head down to Arne in order to try and spot a harrier or two (as it turned out we saw at least three), but still had all of Friday and Saturday to try and find some fish. The Dorset Frome was pushing through hard, while the upstream wind, normally useful when trotting, proved quite a handicap. As I tried to find a rhythm, the gusts would flatten my float and even lift it clear of the water. We changed to heavier patterns, which did negate the wind, but was likely to be impacting our presentation. With so much lead down the line the hookbaits weren’t likely to be moving very ‘naturally’ in the current. It was always going to be a tough day. The water temperature was dropping while the level remained high. 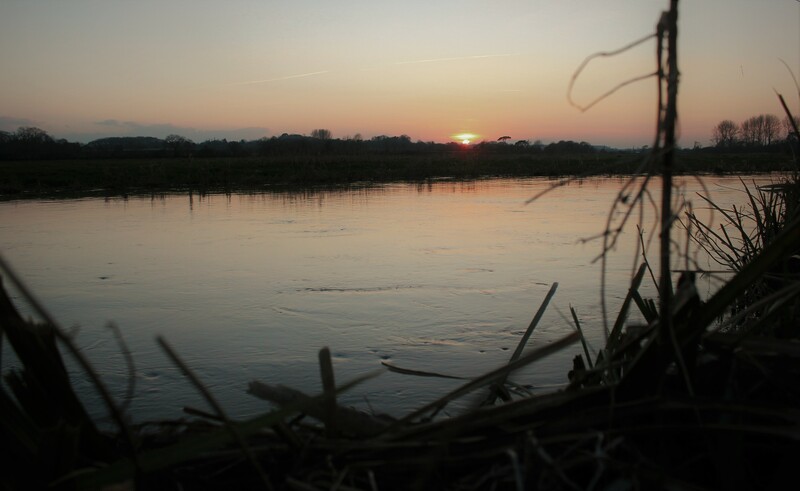 Any run-off from the surrounding roads would be thick with sodium chloride, adding a salinity to the chalk stream water that would stifle the appetite of most of the fish. Given the chill though, grayling were one species likely to feed, and we persevered through the morning despite the lack of interest. Martin fished hard and well and deserved a fish, the bite coming just after lunchtime. It was a small grayling of just a few ounces but represented just reward for some attritional angling. 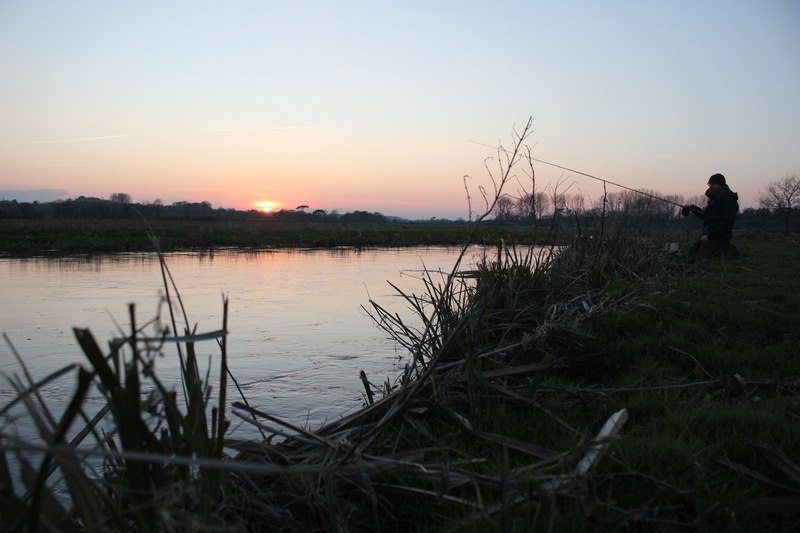 It also inspired us to fish that stretch for longer than we have intended, and by the time we made our way to our afternoon venue, a few miles downstream, the sun was already sinking. I had not fished this particular piece of water before, but immediately liked the look of it. The current was still pushing through hard, but greater riparian tree growth offered more shelter against the wind and would allow for more subtle presentation. There were three other anglers on the bank though, who had not had a single bite between them, but were all fishing with swimfeeders so perhaps a moving bait may give us an edge. And so it seemed to prove. I found a lovely crease coming off the centre curve of a double bend, and on the first run through the float buried as it drifted back into the near bank. It was a lovely grayling, nearing a pound and full of wiry bristle. I thought I may have found a shoal of hungry fish but it took another dozen casts before I had any further indication, and this time I missed the bite. I kept a tiny trickle of maggots going in and regularly tweaked the depth and shotting pattern in order to provoke further response, and after another dozen trots the float dipped slightly. I struck in hope and for a few moments thought I’d hit a snag, but then a couple of lazy thumps suggested I had hooked a big fish. For several moments we were at stalemate, the line singing in the wind and the grayling (it surely was a grayling) just holding station in the current. Then the rod tip throbbed as the fish began to move. A couple of eel-like twists and slow pulls before settling back to sit tight and wait for my move. I was struggling for an answer. There didn’t seem any likelihood of winning the game from where I stood. A straightforward tug of war wouldn’t work. I had 25 yards of line to regain and if the fish kited right and into the heavier water the barbless hook would surely slip. My best hope was to keep it in the slow eddy on the inside bank, where it could plod around on a short line for as long as it needed. Martin, meanwhile, soon had a battle of his own. He had been fishing a steady glide for half an hour into dusk until the float finally dipped and he hooked a fish. It was a grayling, and felt considerably larger than his first fish, but the rod bucked and the reel screamed as something bigger still made a grab for his prize. I rushed upstream to help and saw a vast swirl before the reel screeched again. ‘Salmon by the look of the tail,’ Martin replied, and as if to prove the point the fish was gone with another swish of that tail as the line parted just above the hook. The following morning found us on the Stour, where the bright sunshine and cold water were unlikely to do us many favours. 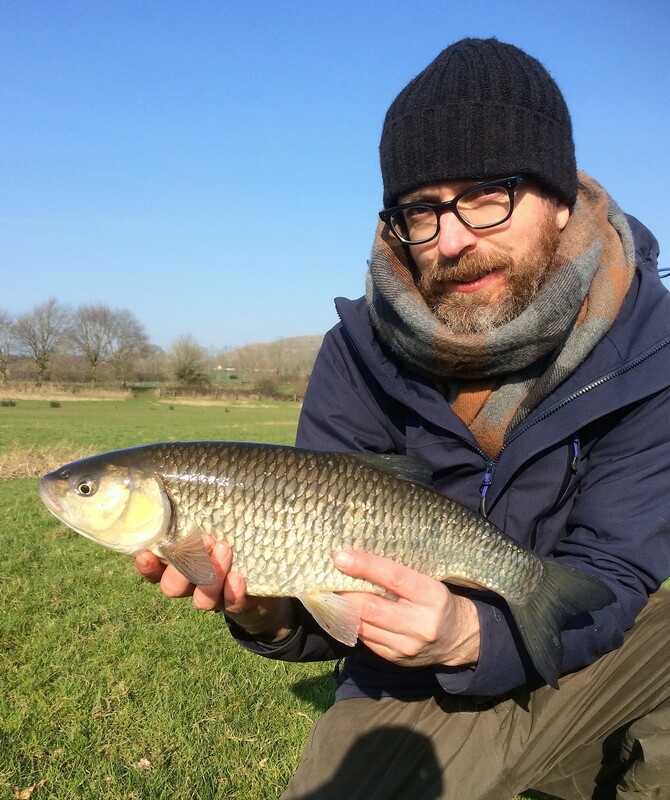 We travelled light and covered plenty of water, finding a shoal of hungry dace beneath a road bridge and some small chub and roach in a deep glide beneath a curve of willow branches. Fish came steadily but would not feed with their usual late season abandon. We would pick off a couple here and there before moving on, and while we were not too surprised at the absence of the hoped-for perch, the complete lack of gudgeon was really disappointing. We enjoyed our day though, and in mid-afternoon Martin again found himself attached to something more substantial. He had been trotting a long, smooth run between a high bank and reed-bed and hooked the fish at the tail of the pool. It was a chub, and a decent size fish for that particular stretch, that Martin did well to land on light tackle and against the heavy flow.